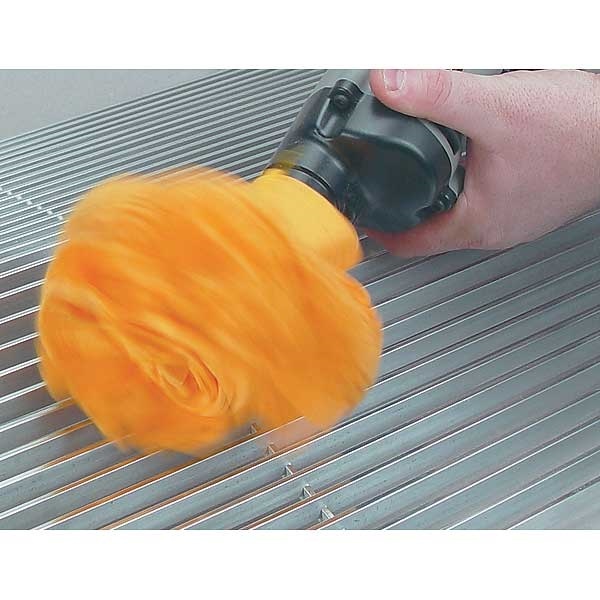 Use the Flitz® Polishing Ball with Flitz® Metal Polish and cut your cleaning time in half! Flitz® Polishing Ball - Insert into 3/8" drill, coat surface of ball with Flitz® Metal Polish, and easily buff out scuffs, oxidation, tarnish, brake dust, pitting, corrosion, and heat discoloration on all metals, paints, plastics, and fiberglass. Unique flap-type ball, made of Italian polishing felt, handles tough polishing jobs on aluminum rims, grilles, trim pieces, diamond plate, and hard-to-reach areas on autos, trucks, motorcycles, boats, or home items. Felt washable. Max 2000 RPM. 5/16" hex shank. Flitz® Metal Polish - Safely cleans, polishes, and protects items up to 6 months! Paste formula cleans and polishes brass, copper, silver plate, sterling, chrome, stainless, nickel, bronze, gold, aluminum, pewter, factory gun bluing, and painted surfaces. Removes tarnish, water stains, oxidation, and finger prints. Contains no ammonia or abrasives.